Getting up at 2 in the morning might shock some of her listeners, but for Pam Jahnke, it’s part of the business. Born in Northeastern Wisconsin, Pam Jahnke grew up in agriculture. Raised on her family’s 200 acre dairy farm, she learned the “farm work ethic” first hand. Pam has been dedicated to agriculture throughout her life being actively involved in both 4-H and FFA activities. She happily served as a 4-H camp counselor, was a dairy exhibitor in county fairs, and even reigned as Oconto County’s Dairy Queen. At the University of Wisconsin – River Falls, Pam studied broadcast journalism and broad area agriculture. She started that campus’s first ever “Farm Show” on radio, and received the top national scholarship from the National Association of Farm Broadcasters (NAFB). After college, Pam moved into her chosen field, doing farm broadcasting, radio and television, from Green Bay to Eau Claire, WI – and she’s never looked back. Pam often says she feels like farm broadcasting and communicating on behalf of food producers is exactly what she was made for. 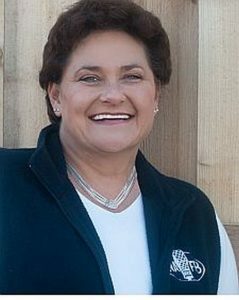 More recently Pam served as the 2010 president of the National Association of Farm Broadcasting, and in 2013 was named Farm Broadcaster of the Year. She’s received many honors, including the “Honorary Recognition” award from UW-Madison’s College of Agriculture, her honorary “American FFA Degree”, and citations from the Wisconsin State Senate. Pam’s been named “Friend of Agriculture” by the Wisconsin Department of Agriculture for her assistance in raising awareness of the “Harvest of Hope” program. She’s been honored as “Agri Marketing Person Of The Year” by the Badger chapter of the National Agrimarketing Association. In her spare time, Pam is active farming in partnership with her brother, sister and parents on the home farm.